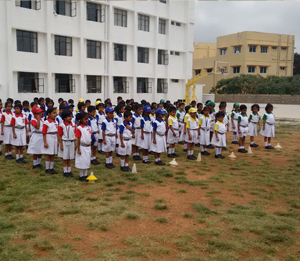 The Assembly at NPS, Yelahanka is a solemn affair. Assemblies are held thrice a week. They are planned to the last detail and function with clockwork precision. The assemblies provide an opportunity to nurture and develop the personality and public speaking skills of students. Assemblies are used as occasions to encourage our students to make presentations and speeches so that they lose their inhibitions and develop confidence to take the stage. National days, festivals, and other days of national and international importance are regularly celebrated to bring in more awareness among our young learners who also participate in these celebrations through thought provoking skits, mellifluous songs and presentations to usher in the day. © Copyright National Public School 2019. All rights reserved.